In honor of having just recently survived our fourteen hour flight from LA to Brisbane, I thought I’d share the articles that helped us prep for such a long flight, as it was the first long-haul either of us had ever done. We’re both accustomed to those European eight-hour flights, but fourteen is a whole new ballgame. In the end, it wasn’t remotely challenging. I slept about thirteen of the fourteen hours; John slept maybe ten or eleven of them. The articles listed below cover the best tips for a successful long haul flight. Hint number one, of course, it to sleep for as long as possible. The Points Guy has spent some time on planes. His list is long and focuses on seat selection. There are definitely some great seat selection apps and principles out there to keep in mind, because starting with a horrible seat only makes the rest of the bullet points marginally helpful. PsychoTraveller is the only YouTuber I watch regularly. She’s got a video on long haul flights and one on long bus/train journeys. They’re silly, but informative. Johnny Jet has the most basic checklist for being prepared beforehand. A little bit of prep with charging, eating, etc., can go a long way before your long haul. HuffPo’s article goes into jet lag a bit. The author makes the point that you should, when possible, add a connection onto the later end of your journey instead of the front end. We didn’t have that possibility, and it turned out just fine. We put effort into keeping awake from Atlanta to LA so that we’d be as tired as possible for our longer flight. It worked well for us. Extra Pack of Peanuts have possible the most and least helpful tip listed first: don’t fly economy. As that’s not particularly realistic for our style of travel, I’ll just continue daydreaming about the lie-flat seats up front. If we do one day have enough points/miles to capitalize, you better believe we will. The Blonde Abroad mentions two helpful points – setting your clocks to destination time before take off to combat jet lag and packing travel-friendly toothbrushes and facial wipes to freshen up during and after your flight. Feeling grimy upon landing makes the trip from the airport to the hotel/AirBnB/couchsurfing host that much longer and more challenging. Rick Steve’s post about jet lag offers the basics that work. Y Travel Blog makes the point that traveling east makes jet lag worse; we traveled west, and our jet lag hasn’t been that bad. She recommends a technique called grounding: standing barefoot on the ground in your new location. Interesting – we’ll have to try it one day. Paul Gardner-Stephen isn’t a travel blogger, but he goes into the fasting technique for starving off jet lag. Food and mealtimes can be key in regulating your internal clock. Lola’s Travels goes into the skin hydrating, freshening thing, but I particularly like the first comment – a massage is always justified at your destination! A great round up, and thanks for including us. 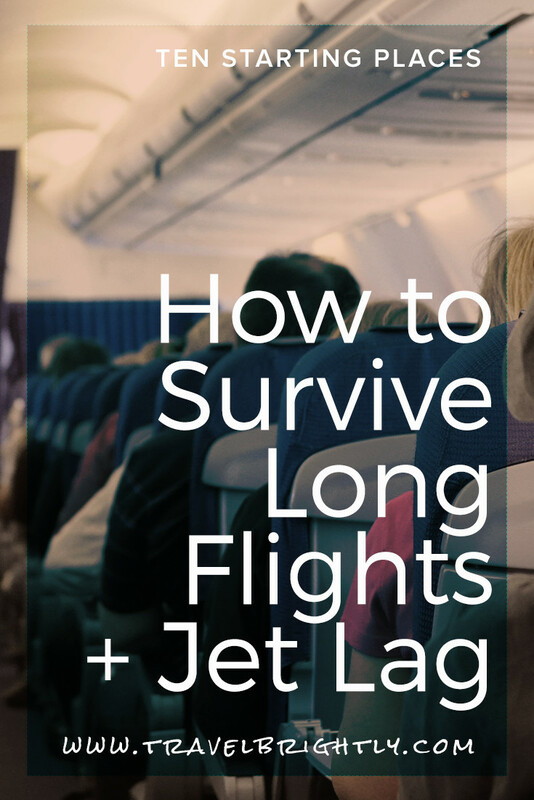 I totally agree – we almost always travel economy, so it’s not usually an option for us either, but when it is…wow, it’s such a great experience and a killer way to kick jet lag! Ha – thanks! We’ll make first class happen one day, and I can’t wait until that day comes!